ARP 1939-1941 on School Driveway. See note below. Photo courtesy of V. Hopkinson. ARP 1939/41 on School Driveway. 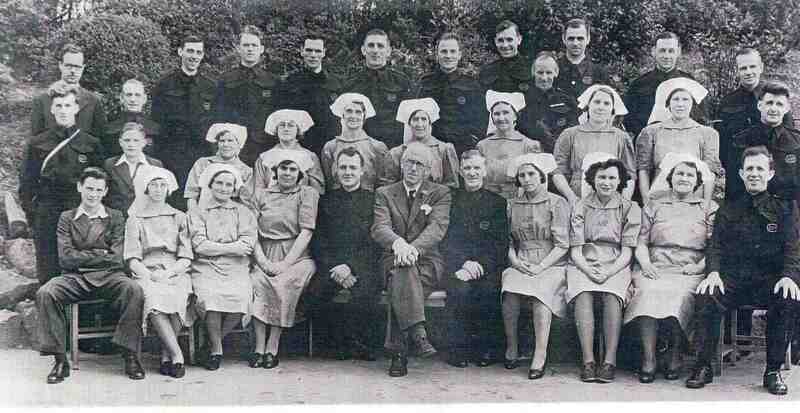 Front row: Leslie Jackson, Mrs Blaiden, Mrs Barker, Mrs Mabel Parsons, Billy Parsons, Dr G.R. Lipp, Mr Preston, Mrs Rose Rivington, Barbara Goodwin, Mrs Goodwin, Fred Stones. Second row: William Barker, Horace Parsons, Mrs Annie Fox, Mrs Cissie Nicholls, Miss Hilda Bennett, Miss Alice Curzon, Mrs Chillery, Annie Jenkins, George Drakett. Back row: Mr Turner, Arthur G. Deakin, Billy Bennett, Billy Wheelhouse, Len Doxey, Harry Jennings, Billy Lynch, Arthur Burton, Albert Hallam, Alf Parr, Cyril Drakett.